“You have one saved message,” the telephone blurted out yesterday. The message was from July 6th. Perhaps I shouldn’t have listened to it, but I couldn’t help myself. It was from the veterinarian, telling me to stop the thyroid medication my cat, Dickens, had just started, in case that was why he was so sick. I remembered that call. I was still hopeful the day I got that message. I didn’t know the thyroid meds had sent my beloved boy into a downward spiral, revealing the cancer that no one knew he had. Dickens was gone four days later. Then there was the label on my front door, telling responders to be sure and look for four cats in case of an emergency. I still can’t bring myself to change that number to three. 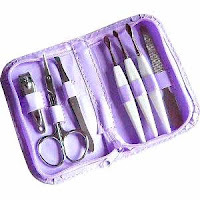 And finally, my nail kit – what could be more mundane? But it wasn’t to Dickens. All those emery boards and implements were like catnip to my boy. He’d always come over and nose around for the nail buffer, picking it up in his mouth with a look that said I didn’t have to worry about cooking dinner – he’d snagged something special for me and his sisters! We often don’t know that we’re going to lose someone special to us. I guess that’s a good reminder to enjoy all those sweet, simple little everyday moments with our loved ones, just in case our journeys with them come to an unexpected end. I hope the last time Dickens grabbed that nail buffer I told him how much I appreciated his hunting prowess. After all, his sisters and I depended on him to keep us fed and happy. Yes, all those little things do get to you. My beloved Bully passed on August 27th. I’m sorry for your loss. Valerie, I’m so very sorry to hear about your loss. I have a special place in my heart for Bulldogs. Chris, imagine those who don’t have things like this to remember–how deprived was their life that they either never shared it with an animal or never learned their special language? It’s really interesting that message is still on your phone…four years later, Sophie still answers my phone. Chris this was an excellent blog post, I appreciate being reminded of just how precious our time with our loved ones is. Novia started her thyroid meds last month and they initially made her sick. I took her off for a time and then started back on them again with no ill effects this time. She is 17 and doesn’t do much anymore but she still loves her life. I’m very sorry about Dickens but I know you know he has a special angel assigned to take care of him. Bernadatte, you’re so right. I can’t imagine life without these memories. I didn’t realize I still had that message on my phone. I wish I was lucky enough to have Dickens answering my phone, as your Sophie does! Thanks, Sandy. I’m very glad Novia is doing better with her thyroid meds. She sounds like one very special critter! And yes, I think the guardian angel who is watching over Dickens has fallen in love with him, just as I did! What a great post Chris! It really is these little things that are hard, and wonderful too! We find ourselves talking about our little Miss Girl a lot lately. It’s funny the odd things we miss about her! She never failed to throw herself back and shake when you walked by – she wanted a belly rub! Tammy, Miss Girl must have been such a sweetheart. One of the things I respect so in critters is how they find a way to ask for what they want. It’s so much trickier for us two-leggeds!